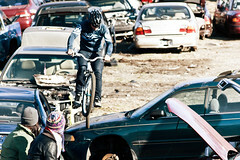 Dialing in the shortcuts at Bilenky Junkyard Cross. Photo by Shira. After the success of last year’s Bicycle Film Festival short film based on The Bilenky Junkyard Cross, it was a bit surreal going back for this year’s race. But once we got there, it was the same junkyard, a different course and a whole lot more people. This edition was nuts. Jam packed with racers and revelers, multiple heats in multiple categories and about the most fun you can have in a junkyard without matches or a wrecking ball. The special features for this year’s course included a conversion van run-through, car hood ride-over, wooden boxes, and a sweet session area for the BMX and trials guys. It was a spectacle. It always is. Here’s the video. See for yourself.